I wish I'd gotten more pictures of Bunny's decorations--the tombstones, the ghosts, the eerie fairy lights! 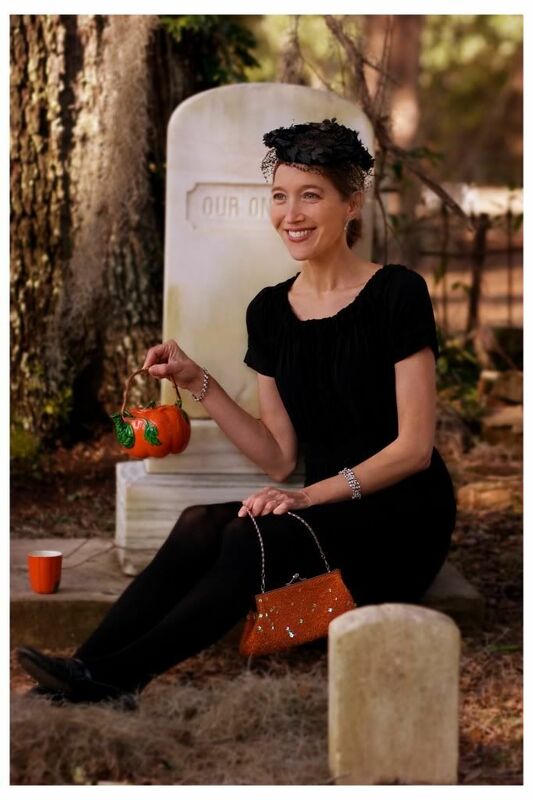 Here I am, getting in the Halloween spirit, having tea at the cemetery. I'm enjoying becoming more and more eccentric in my old age. On Saturday Bunny had her annual Halloween party. Everything was so festive. The old greenhouse (which Bun and Matt now use as a little outdoor sitting area) was lit up with strings of ghostly white lights. Skeletons hung in the trees over little groups of crooked tombstones. Screams and wails and other spooky sounds spilled out of Matt’s workshop. There was so much to eat—popcorn and potato chips and Jelly Bellies, curried tofu, barbecue tofu, cornbread, vegan mac and cheese, and orange-frosted Halloween cupcakes. We drank sparkling lemonade out of fancy champagne flutes in the moonlight. Bun was dressed up as an evil escaped marionette. She was wearing creepy white and black face makeup, purple-and-black-striped stockings, a short black dress with a crinoline, and pigtails with purple daisies in them. Strings hung from her wrists, neck, and ankles. When Rob and I arrived for the party she was still doing mundane things, like feeding her chickens and setting the table—but she was dressed like a crazed renegade marionette. It was quite a funny sight. Sophie and Kris arrived soon after Rob and me. Kris was dressed as Miss Piggy in a pig snout and ears, a ball gown, and elbow-length gloves with big sparkly rings and bracelets on the outside instead of the inside. Sophie was an adorable witch in orange and black taffeta. Sophie started sampling various drinks. She picked up an Orangina. “It’s kind of like an Orange Crush,” Bun said. Sophie took a sip. “It’s like barf!” she cried. “You’re like barf!” Rob said. Rob and Sophie love to fight. It wasn’t dark yet. The air was so warm and dry, and the late afternoon sunlight tinted everything with gold. There were purple beautyberries everywhere, and red peppers shaped exactly like little Chinese lanterns. Heirloom roses. Ageratum. Sunny swamp sunflowers. Sophie wanted to feed the chickens again, so Bunny brought out some fancy organic wholewheat bread for a treat. Then Sophie, Bun, and Kris all crouched in the wood shavings around the chicken coop and fed them little crumbs. They looked so funny in all their tulle and lace and Halloween finery, crouching in the wood shavings. Sophie was holding Myrtle, Bunny’s new baby chick (a Barred Rock just like Beatrix). Myrtle is so cute, as small as a quail. She has a pretty face and the tiniest, softest comb, still a light pink. She follows Beatrix around and makes little soft peeping sounds all the time. Matt calls her Peep. “Oh, is she Peep now?” Mom asked hopefully. Mom hates the name Myrtle. “Well, I like Peep better than Myrtle,” Mom said. “I know, Mom!” Bun laughed. Mom has not been shy about her opinion of the name Myrtle. Sophie went on and on, relentlessly. I was dying laughing. I was in physical pain. “That sounds about right,” Rob said. Just then, Jake arrived (quite unexpectedly). He burst onto the patio wearing a Scream mask and a long black robe and wielding a huge bloody plastic knife. We all squealed and laughed. He flopped down in a chair and pulled off his mask. His chubby cheeks were flushed with fever: “I’m going to kill you, Mommy,” he said, crossing his arms and pouting. “Sophie was just doing impressions of your mommy and me on the phone,” I said. Phil (Jake and Sophie’s dad, Kris’s husband) stepped onto the patio wearing a huge rubber monster mask and a black velvet gown belonging to Kris. Phil is so funny. He’s so shy and quiet—and then he shows up wearing a form-fitting woman’s dress and a monster mask. He was talking tough, but Mom says that when he's "watching" these movies, he spends most of his time in another room. "He always wants to watch these scary things," she said, "but as soon as they're on, he leaves. And I'm supposed to stay in there with the TV and watch and kind of give him a report from time to time on just how scary things are getting." The sun had set. Sophie wanted to play with Bunny’s selection of glow sticks and glow necklaces. She wanted to do cartwheels in the grass in the dark. “Come on, Bunny! Come on, Jake!” she cried. Mom had served Jake a little plate of food—macaroni and popcorn. Jake got up to join Sophie. “Nobody take my food!” he cried as he ran off. You see, every year the centerpiece of Bunny’s Halloween party is an elaborate treasure hunt in the dark for the kids (Sophie and Jake). Last year we had a marvelous hunt, with the treasures hidden high in a tree in a black plastic garbage bag. A rope hung down from the bag, and the kids had to pull the rope to get their treasure. We always pretend that a witch hid the treasure; it is the witch’s treasure, and she doesn’t really want the kids to find it; she merely wants to tantalize, torture, and thwart them. So the clues are kind of teasing and insulting. They also require the kids to undergo certain trials; they have to get their hands dirty. They have to dig in Bunny’s worm bin. I don't know if I can convey just what a magical event the treasure hunt really is. But it's like something out of a fairy tale, the kids hunting for clues in the darkness, in the inky, woodsy gardens, running around in long costumes, holding little bright camping lanterns. Bunny's yard is very romantic, filled with ferns and weird old statuary and camellias planted in the '40s. He kept quitting the hunt and then immediately regretting his decision and joining up with us again. The moonlight was scaring him. And so were the shadows and the fairy lights . . . and the strange symbols written in chalk on the stone paths. There were chalk messages too: “Help!” and “Redrum.” There were arrows pointing in different directions. Weird pictographs. Roman numerals. The kids were sure the messages on the stepping stones held the key to the location of their treasure (but it wasn't true). Sophie was creeping along with her flashlight, reading all the messages. “This one says ‘chalk’!” she cried. Bunny gave Matt a look: “Matt!” she yelled in a whisper. We finally got them off the stepping stones and hot on the trail of their treasure. One of the best clues was one that instructed them to knock on the door of Matt’s workshop, a creepy, magical place with stained glass windows and shelves full of Matt’s weird metal-detecting finds. Sophie knocked, and the door mysteriously opened. And there was a hunch-backed creature in a black cape (Matt) handing her the next clue. I was so startled, I don’t know how the kids handled it. It was so neat the way Matt slipped away from the group without us even noticing. At another point he hid himself deep in a huge pile of pine straw and jumped out at the kids when they were searching through the straw for their clue. It was genius! The pile of straw was in an especially dark part of Bunny’s camellia forest. This is simply how Jake is. Sick or not, he is somewhat of a drama queen. When Sophie read it, Kris and I burst out laughing and Matt got all sheepish. “Well, we were tipping it a little last night when we were writing clues,” he explained under his breath. Jake hustled along in his long velvet robe and tennis shoes. He was moaning and sighing. He was so scared. “I better at least get a Webkin out of this!” he groaned. “He’ll love it,” I whispered back. Well, Jake completely balked at that one. “Await your fate? !” he cried. “No way! I’m not doing it!” And he ran back to the patio to sit on Mom’s lap. But of course he was back five seconds later, just in time for the reading of the final clue. The two kids rushed up the brick steps that lead to Bunny’s front door. A roll of string lay in the shadows on the top step. The string hung down the steps and disappeared into a dense, dark grove of sweet shrub. So the kids started crawling through the sweet shrub and under the tree-sized camellias, following the string. Matt had the whole area “decorated” with fake spiders and rats, but it was so dark the kids didn’t even notice the profusion of plastic rodents and arachnids. I was crawling with them, encouraging them. At certain points they’d get too scared and make me go first. We crawled under the yaupon, through the coonties, through stripes of shadow and moonlight. Finally the string ended. It was tied around a large black bag. “Is it a baby?” I cried. "Is it dead?" The kids were too scared to open the bag. “You do it, Leslie!” Sophie said. "You have to help me!" I said. And in a minute we had it open, and we could see the gaily wrapped presents inside, glimmering and shining in the darkness. Jake started ripping into his present right there under the bushes. The gum-making kit was quite impressive-looking and he was totally thrilled with it. He was whooping and exclaiming and making all kinds of noise: "Look what I got, Sophie! Sophie, look at mine!" I just loved it. It was as if he thought the kit would last forever; it was as if he thought it was really a tiny factory and would be rolling out gum for decades. He’d never have to buy gum again but would instead have an infinite free supply. . . . I loved his magical thinking and wished that reality would not inevitably disappoint him. But of course it will. Jake sat in his chair looking completely delirious now. His eyes were half-closed. 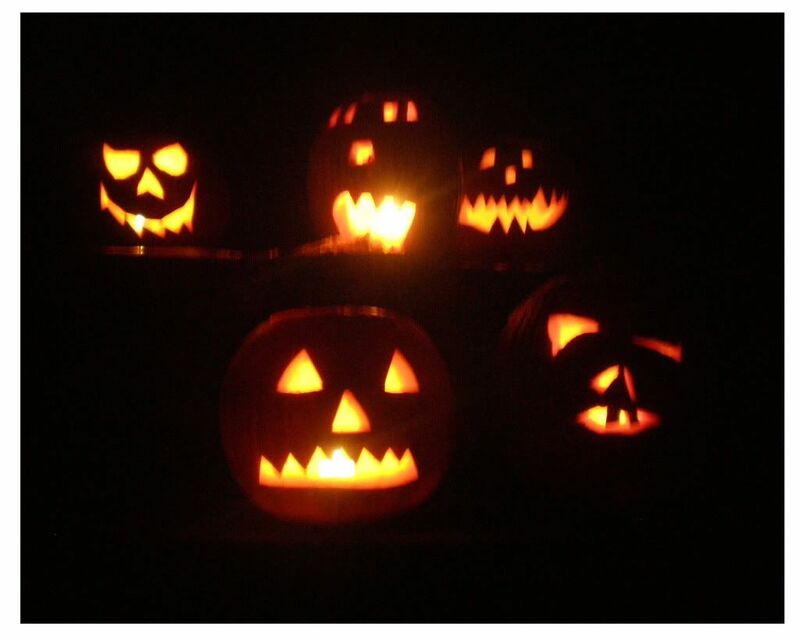 Matt was playing another Halloween spooky sounds CD, and screams and howls filled the yard. “This music is really disturbing!” Jake observed. I was looking at Jake in what I intended to be a sympathetic, gentle way, but he got mad: “Don’t look at me like that, cupcake!” he said. I really do think he was delirious. His parents took him home (Sophie too), and Bun, Matt, Rob, Mom, and I stayed and talked in the warm moonlight about trick-or-treating in the old days, when we were young, and all the candies we remembered (Mary Janes, peanut butter logs, peanut butter kisses, Wacky Wafers). I remembered how Kris and I always wanted to trick-or-treat at Senator Stone's house in the rich part of town--because all the neighbor kids told stories about how he'd be handing out $10 bills.